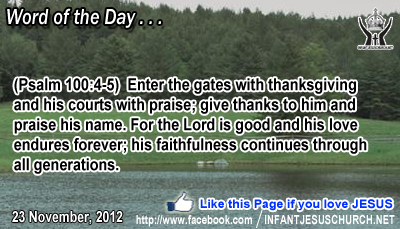 Psalm 100:4-5: Enter the gates with thanksgiving and his courts with praise; give thanks to him and praise his name. For the Lord is good and his love endures forever; his faithfulness continues through all generations. Heavenly Father, the Almighty, the God on whom the generations trusted, you alone, LORD, are God. We praise you for your continuing grace and mercy. We praise you because we want our heart tuned to your will. We praise you, because we want to prepare for our longest lifetime, the one in your presence. We praise you in Infant Jesus' name. Amen. 45And he entered the temple and began to drive out those who sold, 46 saying to them, "It is written, `My house shall be a house of prayer'; but you have made it a den of robbers." 47And he was teaching daily in the temple. The chief priests and the scribes and the principal men of the people sought to destroy him; 48but they did not find anything they could do, for all the people hung upon his words. The money changers took advantage of the poor and forced them to pay many times more than was right-in the house of God no less. Their robbery of the poor was not only disgrace to God but unjust toward their neighbor. In explanation for his daring action Jesus quotes from the prophets Isaiah and Jeremiah. His act of judgment intends to purify the worship of God's people and to order their erring ways. In spite of the objections of the religious leaders, no hesitation because Jesus was appropriate their authority in the house of God, the people who listened to Jesus teaching daily in the temple observed him with great awe and respect. How hungry are we for God's word? The Lord calls us to be a holy people who worship him with respect and gratitude for his great compassion and kindness towards us. Do we allow God's word to change you in his way of love and holiness? Loving Infant Jesus, you open wide the door of your house and you offer us to enter assertively that we may worship you in spirit and truth. Help us to draw near to you with thankfulness and joy for your great mercy. May we always revere your word and give you suitable praise and worship.